This book on Jyotisa Sastra deals with the subject matter of Indian Astronomy and Mathematics. It throws light on the systematic study on the life span of a man. This book has highlighted, explained, discussed and commented upon the various texts and commentaries right from Aryabhatlya. It is a key to the hidden treasure of scientific know ledge of time and space. The present book will make a reader spell-bound with the knowledge on the contributions and achievements of our ancient sages, which are yet to be understood thoroughly. It is unique in the sense that, it provides the basic methods of calculations as prevalent in ancient India, a glimpse of the history of development of Indian Astronomy and Mathematics, the textual tradition in Astronomy and Astrology and many other related topics. It is appended with an updated bibliography to refresh the scholars with first-hand knowledge in Indian Astronomy and Astrology. This book is a testimony on the serious scholarship of Prof. K.V. Sarma, whose observations, analysis and interpretation of the Jyotisa Sastra are generally accepted by the scholars. The editor of the book is now Professor and Head, Dept. of Sanskrit and Director, New Catalogus Catalogorum (NCC) Project, University of Madras. He is also now the Chairperson of the school of Sanskrit and other Indian Languages, University of Madras. Prof. Dash trained under the guidance of Prof. S.D. Joshi in Paninian Grammar and Probal Dasgupta in Modem Linguistics, has tried to utilize his 'knowledge both in teaching and research at the University of Madras. More interest in Manuscriptology was evinced after taking over the Director and Chief Editor of New Catalogus Catalogorum Project of the Dept. 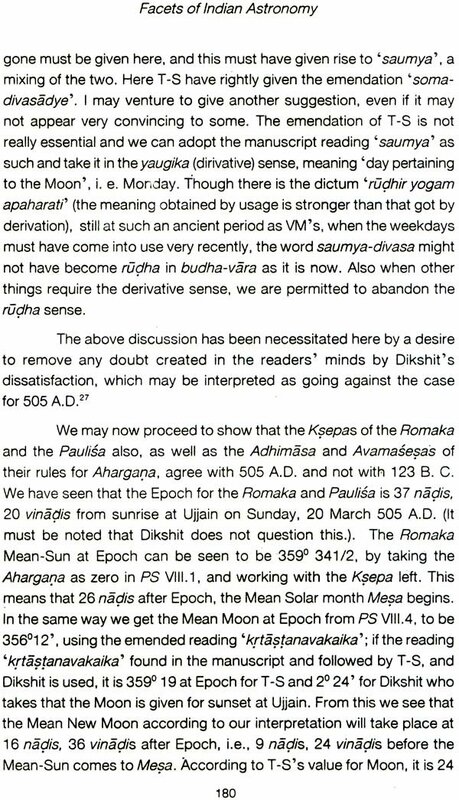 of Sanskrit. It gave more scope in understanding and working on Manuscriptology and subsequently by taking up the Honorary Directorship of Sree Sarada Education Society Research Centre, Chennai founded by Prof. K.V. Sarma. It envisaged privilege for more works in editing the works of Prof. K.V. Sarma, which are the rich mines of information and basic knowledge of Indian heritage and Culture. He has edited the articles on Manuscriptology of Prof. K.V. Sarma in a book form, which is published under the title “New Lights on Manuscriptology”. It is being slowly admitted by the scholars and scientists of the world that most of the significant inventions or discoveries made by the scientists in the recent past in various branches of science and technology have their moorings in ancient Sanskrit Literature that made its appearance with the revealation and compilation of the Vedas in this sacred land of Bharat. This unique historic intellectual development of the mankind in India can roughly be corresponded with the dawn of a civilized and cultured human society on the surface of the Earth. The historians, despite their continuous efforts and intellectual exercises to determine the appropriate period of the golden era of the revelation of the Vedas in India, fail to reach a consensus meaning thereby the Sanskrit literature is probably the ancient-most literature in the world. Several meaningful works in various languages including English & other foreign languages produced so far by both eastern as well as western scholars, have substantiated a fact beyond doubt that various streams of science and technology such as Physics, Chemistry, Biology, Engineering, Medicine, Computer Science, Agriculture and others have drawn their origin from the concepts, nomenclature, contemplations and theories developed by the ancient seers and savants of this country in their monumental works written in Sanskrit. Such two important branches of modem science are space-related Astro-physics and Mathematics that directly correspond with Jyotisham and Ganitam respectively. In view of the outstanding contributions made by our ancestors like Aryabhatt, Bhaskaracharya, Brahmagupta, Lilavati, Samanta Chandra Shekhara to name a few, in these two important branches of science, our country has been adjudged as an advanced centre of scientific learning and research in these two areas. Needless to mention that Professor K.Y. Sharma, former Director, Institute of Sanskrit and Indological Studies, Hoshiarpur, Punjab University, who completely dedicated his life and career to find out this truth, is acknowledged as a pioneer researcher in this field in twentieth century. A doyen of Sanskrit literature and an unparalleled master on indological studies, Prof. Sharma has written nearly three hundred books and six hundred research articles to his credit in various subjects including an area that intends a synergy of both modem scientific knowledge and ancient Indian lore. The present book “Facets of Indian Astronomy” is a precious collection of articles of Professor K.V. Sharma. While expressing our gratitude to the learned members of the Editorial Board for their endeavour in collecting these articles and preparing this volume, we deem it a proud privilege to bring out this book on behalf of our University, which, I am confident, will further enhance the status of our Institution, already accredited at Atgrade by NAAC and recognized as Centre of Excellence by the U.G.C. No doubt, most of the articles, found place in this book, were published in various journals and magazines earlier and some of them were presented in national and International Seminars and Conferences; but availability of all these research papers on a particular thrust area i.e. 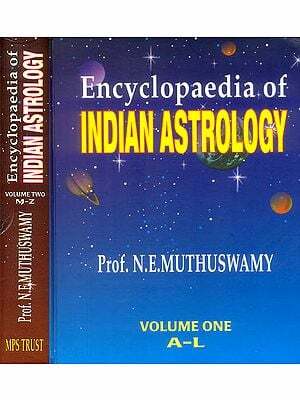 Indian Astronomy, has been ensured through the publication of this volume for all categories of readers and researchers interested in the subject. My special thanks are due to all the members of the Department of Research & Publication of our University but for whose constant efforts and intellectual exercises, this volume would not have seen the light of the day. Our country has been a source of knowledge in so many branches of learning from the time of the Vedas. Not only that people were involved in meditation, tapas, religious austerities or spending their time appreciating nature and making literary compositions, but were also given to serious scientific inquiries. In fact, this was given the status of a Vedanga or Upanga. That way, development of Astronomy and Mathematics is one of the prides of India. Our ancestors have made so many contributions that they were ahead of their western counterparts by at least a thousand years, in this and many other fields like metallurgy, medicine, etc. 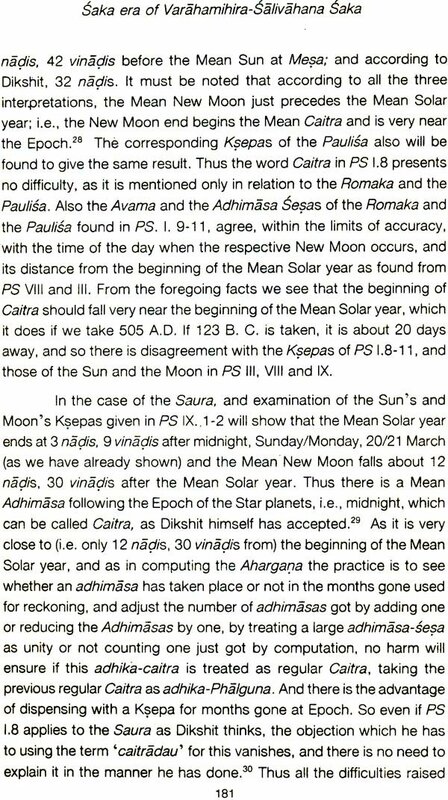 The Sanskrit word Jyotisa generally is misunderstood to mean astrology, though originally its started off as Astronomy. The word is derived from Jyotih (padartha) meaning luminous bodies (found in the sky) and the Sastra dealing with them after keen observation of them is Jyotise. Thus Astronomy was developed, as a Vediinga to facilitate calculation of time, and the right time to perform the Vedic rituals and Laukika karma. Since this needed not only keen observation of the celestial bodies but also a lot of calculations, there was also a lot of development in mathematics. Thus we find a parallel development both in Astronomy and Mathematics. There were both heliocentric and geo-centric views of the world. Nonetheless the calculations were perfect and also accurate predictions could be made about lunar and solar eclipses, which are a real marvel, given the highly haphazard path of the moon in the back drop of the stars. Most of the authors were both Astronomers and Mathematicians making significant contributions to both the fields. There were luminaries like Aryabhata, Bhaskara I & II, Varahamihira, Brahmagupta, Nilakantha Somayaji, Paramesvara to name only a few, who were stalwarts and some of whose contributions have found place into text books, without any acknowledgement, however. These sciences were growing even when our country was under the shackles of Muslim rule and many works were also being translated into Arabic or Persian, which were later translated into Latin and other western languages. But subsequently with advent of English education in India the study of ancient Indian sciences was overshadowed. It is a matter of great pride that vast literature in Indian Astronomy has been produced in India. A survey of literature on Astronomy conducted and prepared by David Pingree with the title: “Census of the Exact Sciences in Sanskrit”, in five Volumes (up to letter Published by American Philosophical Society, Philadelphia.) bears testimony to this fact. His survey reveals that there are more than one lakh manuscripts in Jyotise (including Astronomy and Astrology) which are available in India and abroad. However, the number of works published or studied so far has been very less compared to the enormous wealth of source materials. In the backdrop of this scenario, the present book “Facets of Indian Astronomy” (a collection of selected articles of Prof. K. V. Sarma) is a milestone in the field of research and scientific study of Indian Astronomy. This work highlights various aspects of Indian Astronomy which have been crystallized in the traditional learning. Prof. K. V. Sarma, a pioneer in this field has made all efforts to bring out the salient features of Indian Astronomy in various research papers, which has earned him name and fame. The present work, no doubt, will bridge a gap in understanding traditional and modern Astronomy and Mathematics. Scholars interested in this branch of learning will definitely take interest to know our ancient thoughts in understanding and calculating the movement of celestial bodies and also their impact on human life. It is our great hope that this book will kindle the young minds to think more and take up studies in this area to establish our rich heritage and culture as a worthy inheritor of this great ancient Indian tradition. I am thankful to Rashtriya Sanskrit Vidyapeeth, Tirupati for their kind consideration to publish this book. The Untenability of the postulated saka of 550 B.C.